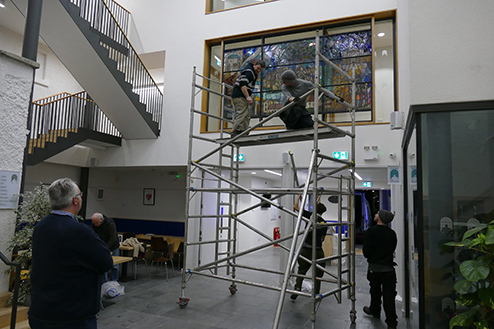 A brand new, specially-commissioned stained-glass window has been installed at the New Room, otherwise known as John Wesley’s Chapel, in Bristol. The window takes the form of a triptych – a three-panel work of art – and illustrates the remarkable life of John Wesley. It now has pride of place in New Room’s new Heritage Lottery-funded visitor centre. Devizes-based glass artist Andrew Taylor, who designed the window, has been working on it for 14 months. An expert in designing and installing church windows, Andrew has been working with stained glass for 25 years and is a Fellow of the British Society of Master Glass Painters. Andrew Taylor said: “It feels a privilege to have been invited to design and make this window for the modern extension at the New Room. “Having had a Jesuit education, I knew little about John Wesley and his teachings, so I’ve enjoyed doing research for the project and learning more on his life and work. 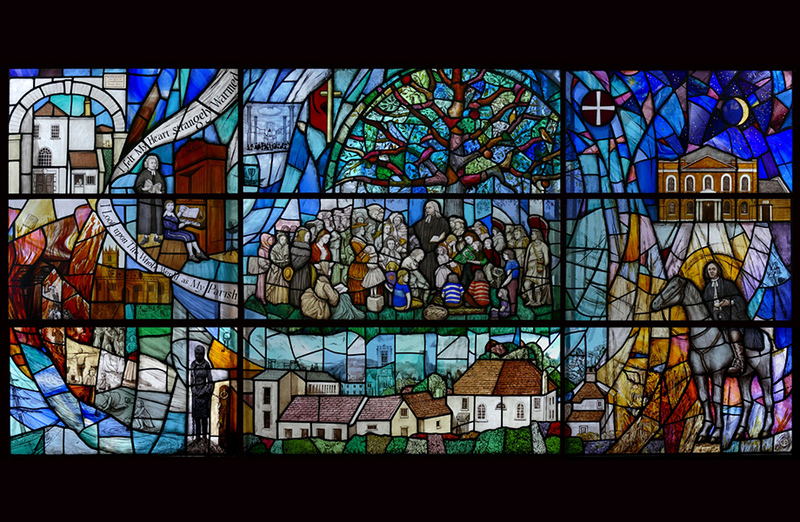 “My aim was to make a vibrant and colourful background of painted glass with of references to John Wesley’s life and history, into which cameo scenes and symbolic images are laid out as if on a screen or map. 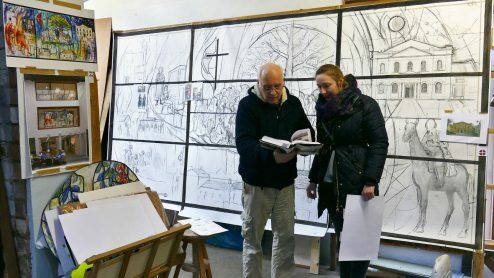 Methodist historian Gary Best, volunteer warden of the New Room, says: “Stained glass is an art form usually associated with churches but today 90 per cent of commissions are undertaken for public buildings. Styles change but this vibrant and dynamic art form is still able to tell a story in a uniquely beautiful way through its use of colour and light. The visitor centre features a state-of-the-art museum, a new library and archives store, an award-winning café, a gift shop and an education/conference centre, and is open Monday to Saturday 10.30am to 4pm all year round. It is located on Broadmead, in the heart of Bristol’s central shopping district. For details see newroombristol.org.uk or call 0117 926 4740.